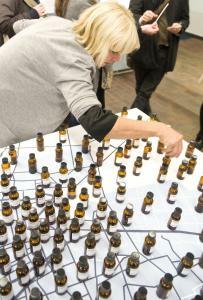 Sissel Tolaas's exhibit ''TALKING NOSE'' features bottled air samples (left) from 200 neighborhoods in Mexico City and a map of the locations (above). CAMBRIDGE _ The smell display is what I like best. It's part of a terrific new exhibition called "Ecological Urbanism," now at the Harvard Graduate School of Design. An artist named Sissel Tolaas gathered air samples from 200 neighborhoods in Mexico City and bottled each of these in a tiny glass bottle. She then asked 2,000 people to sniff and record their responses. Those responses, which are carefully labeled on the bottles, are as delicately discriminatory as those of a wine connoisseur. "Rusty, sweet and old," is one. "Pleasant, aromatic, light, perfume, flowers, vanilla," is another. A huge video screen shows us the noses of people sniffing and talking - "TALKING NOSE" being Tolaas's title for the whole production. A map on the wall shows you where each of the 200 neighborhoods is located in Mexico City. There's a do-it-yourself scratch-and-sniff panel, too. Sound silly? But there's an argument behind it. Tolaas thinks we've over-civilized ourselves to the point that we've lost touch with most of our senses. She says smell has been repressed in modern Western culture. Smells are associated with degeneracy, as in such phrases as "He smells," so we ban them from our cities and our lives. There are, Tolaas says, 10,000 perceptible smells. We've cut ourselves off from a richly sensory part of life. Sissel, who lives in Berlin, is now, of all things, a visiting artist in the Graduate School of Design, an institution that normally teaches the more restrained disciplines of architecture, landscape architecture, and urban and regional planning. Her presence there is, well, a breath of fresh air. "TALKING NOSE" is only one of dozens of exhibits in this show. "Ecological Urbanism" sounds like, and I guess it's meant to sound like, an oxymoron. But that's the whole point. "Ecological Urbanism" is a name for a world that contains and thrives on opposites. We've sorted ourselves out too much, it implies, just as we've sorted smells out of our sensory experience. We should mix things up again. Thus green spaces and built spaces should be interactive, not opposed, not separated into city on the one hand and country on the other. And creative designers shouldn't be separate either, but should work together in interdisciplinary teams. A high-rise building - "Le Tour Vivante" - where each floor contains both dwellings and agriculture, all run by wind turbines and photovoltaics. A "Soft House" in "Soft Cities," in which walls and ceilings are constructed of a textile - a "thin film of solar nano materials" - that generates and stores energy. A "City Car" that comes in several versions, most of which look like stuffed animals and aren't much bigger. You'd plug it into a charging station or stack it with other cars, like pillows. A flying "robotic insect" dreamed up by Harvard's School of Engineering and Applied Sciences. The projects come from all over the world as do, today, the school's faculty and student body. Geography and culture are thus another kind of mix. So is the presence of those robot-insect engineers, guys you don't expect so see in an architecture school. The exhibit opened with a four-day conference with an expanded title, "Ecological Urbanism: Alternative and Sustainable Cities of the Future." I had to miss much of it but what I saw was, once again, fascinating, full of odd facts such as that Toronto now is home to more Muslims than Presbyterians. Both the conference and the exhibit were initiated by the school's dean, Mohsen Mostafavi, now in his second year. I think they can be taken as a deliberate statement of his goals. In an interview, Mostafavi said that he hoped to open the barriers between disciplines and get them collaborating more - something not always easy to achieve in academia. He spoke of the need for architecture that would not be merely visual, but would deal with the human body, with health, with a world that is "lived in, that we breathe and smell, that encourages social interaction, participation, even disagreement." Unlike some past movements in design, he said, this one should not be "a new form of religiosity, not a fundamentalist green movement." It's no secret that the Harvard design school has not been a leader in the green revolution of recent years, in which architects and other designers have begun to face up to a world of shrinking resources, social injustice, and changing climate. But it's getting healthy upward pressure from the incoming students, who tend to be interested in global problems and new technologies. The conference played to a packed house and most of the audience seemed to be students. The exhibit's chief curator, Gareth Doherty, a doctoral student at the school, calls it only "a first glance at what ecological urbanism is and might be." Maybe so, but it's as good a look into the future as you'll find today. "Ecological Urbanism" is up through May 17 in the lobby of Gund Hall at Harvard, 48 Quincy St., Cambridge.